A new peripheral neuropathy activities measure, the Overall Neuropathy Limitations Scale (ONLS), was derived by modifying the Overall Disability Sum Score (ODSS) slightly. Its inter-rater reliability was found to be high and its correlation with the ODSS (r = 0.97), 36-item Short Form Questionnaire Physical Component Summary Score, and participation and impairment measures was significant. Acceptable responsiveness (standardised response mean 0.76) was shown by the ONLS. The results obtained from the questionnaire agreed closely with those obtained from observation of the tasks on the ONLS, but were not equivalent. The simplicity of the ODSS is shared by the ONLS, but the ONLS has better content validity and less ceiling effect, which may make it more useful for clinical practice and research. The Overall Disability Sum Score (ODSS) was the first scale designed to assess the limitations of patients with immune-mediated peripheral neuropathies.1 It was derived from the Guy’s Neurological Disability Scale,2 a scale that was developed for assessing disability in patients with multiple sclerosis. 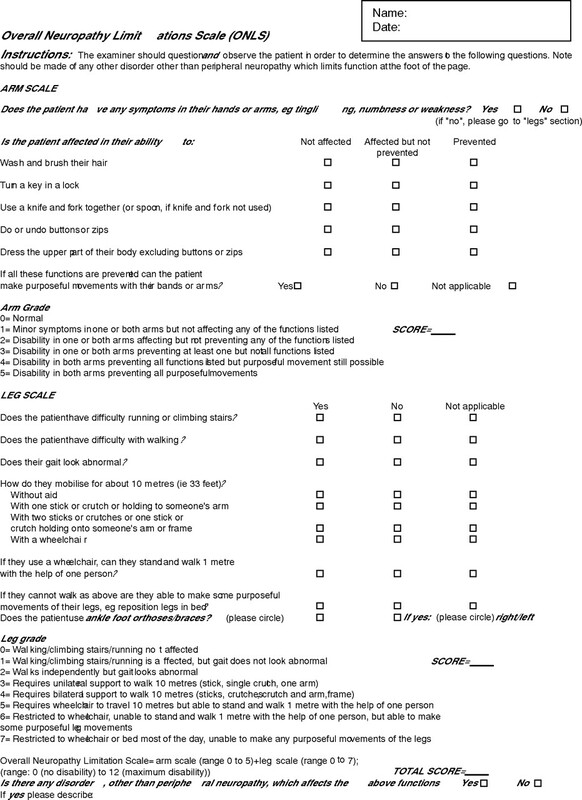 The ODSS focuses on upper and lower limb functions, and consists of a checklist for interviewing patients. It is scored from 0 to 5 on the upper limb section and from 0 to 7 on the lower limb section. A score of 0 indicates no limitations (the ceiling of the scale) and a score of 5 or 7 indicates no purposeful movement. The published description of the ODSS, however, does not interrogate patients on difficulties with climbing stairs or running. To reduce a possible ceiling effect, we have modified the ODSS slightly to include climbing stairs and running. Specifically, the ODSS item “Does the patient have difficulty walking?” has been supplemented with “Does the patient have difficulty running or climbing stairs?” on the new measure, the Overall Neuropathy Limitations Scale (ONLS; appendix). Therefore, to score 0 (indicating no limitations) on the lower limb section of the ONLS, the patient must now have no difficulty running or climbing stairs, in addition to walking. The remaining scoring criteria are not different from those in the ODSS. We have refined the instructions (available online at http://www.jnnp.bmjjournals.com/supplemental) for administering the scale. We also investigated whether the ONLS could be used as an observed measure by clinicians watching patients perform the tasks outlined on the ONLS. The changes to the scale, although minor, and its use in a wider range of peripheral neuropathies, required a renewed clinimetric evaluation, which we present here. With permission from our local ethics committee, we filmed 35 patients performing the tasks listed on the ONLS in addition to completing the ONLS interview. The film was scored independently by four raters: two neurologists and two physiotherapists. We then audited the use of the ONLS interview in 65 other patients with any form of peripheral neuropathy, who were attending the peripheral nerve clinic at Guy’s Hospital, London, UK. Fifteen neurologists were shown the ODSS and ONLS and asked to complete a questionnaire to determine whether it would be a clinically useful measure (content validity). A physiotherapist (RCG) or a neurologist (RACH) collected the scores on the ODSS,1 ONLS, 36-item Short Form (SF-36) Questionnaire,5 Multiple Sclerosis 12-item Walking Questionnaire,6 Rotterdam Handicap Scale,7 Modified Rankin Scale,8 Medical Research Council Sum Scores (expanded to include the first dorsal interossei)9,10 and 10-m walk times. In 20 patients, two raters completed the assessment on the ONLS on the same occasion. Twenty four repeated measurements on the ONLS and ODSS were collected over 1 year to determine the responsiveness. Construct validity was investigated with Spearman’s rank correlation coefficients between the ONLS, observed ONLS, ODSS and other measures. Intraclass correlation coefficients (ICCs) between two raters were calculated using a one-way random-effects model to allow a direct comparison with previous reports of reliability of the ODSS questionnaire.1 Agreement was also assessed between four raters on the observed ONLS by using a two-way random-effect ICC. The internal consistency of the ODSS and ONLS was assessed using Cronbach’s α. Responsiveness was estimated by using the standardised response mean (SRM = absolute mean change in score/SD of the change in score). The two-tailed Wilcoxon test was used to investigate differences between repeated measurements. Significance was set at p<0.05 for all tests. Of the 100 patients (51 men, mean age 58 years), 12 had GBS, 42 had CIDP, 11 had chronic idiopathic axonal polyneuropathy, 13 had paraprotein-associated demyelinating neuropathy, 9 had Charcot–Marie–Tooth disease and 13 had other neuropathies. The scores ranged from 0 to 12, with a mean of 4.3 (SD 2.2); the ODSS also ranged from 0 to 12, with a mean of 4.19 (SD 2.3). The total score was at the ceiling or at the floor in 2% of the patients on the ONLS and in 3% of the patients on the ODSS. Of the scores on the lower limb section, 13% on the ODSS were at the ceiling of the scale (scoring 0) compared with 8% of those on the ONLS. We found no systematic differences between the ONLS and observed ONLS, and the ODSS (Friedman test, p = 0.12). Fifteen neurologists independently preferred the ONLS to the ODSS and considered it to be appropriate for use in clinical practice. The ONLS correlated closely with the ODSS (r = 0.97, p<0.001) and similarly to the ODSS with respect to measures of impairment (10-m walk time and Medical Research Council Sum Score), limitation, handicap (participation) and health-related quality of life (table 1). The Multiple Sclerosis 12-item Walking Questionnaire associated more closely with the ONLS than with the ODSS. The observed ONLS correlated significantly with the score on the standard ONLS (r = 0.86, p<0.001). We found minor differences between the ONLS and the ODSS on the lower limb section, as five patients scored 0 on the ODSS but scored 1 on the ONLS, reflecting the different scoring criteria on the lower limb section. Correlations between the ONLS, the ODSS and impairment, participation and limitation items were similar for 54 patients with GBS and CIDP and 46 patients with other forms of peripheral neuropathy. The correlations with quality-of-life items were also similar. The ONLS and the ODSS, however, correlated significantly with the Role Limitation Physical Subscale of the SF-36 in patients with GBS and CIDP (r = −0.52, p = 0.028; n = 18 for both), but not in patients with other forms of peripheral neuropathy (r = −0.09, p = 0.74; r = −0.04, p = 0.87; n = 17 for ONLS and ODSS, respectively). Two independent observers achieved near-perfect agreement on the ONLS (ICC 0.97). The raters disagreed on only 1 of the 20 cases. When four different raters scored the ONLS from their independent observation of 35 participants, complete agreement was achieved in 18 cases (ICC 0.97). The internal consistency of the ONLS and ODSS was identical. Scores on the ONLS and the ODSS did not change markedly between measurements (mean 31 weeks, range 3 days to 52 weeks). Both the ONLS and ODSS captured change to a similar extent. The standardised response mean of the ONLS was 0.76 (95% CI calculated with a “bootstrap” procedure 0.67 to 0.81) and that of the ODSS was 0.88 (0.8 to 0.95). We have shown that the ONLS and ODSS have a good inter-rater reliability and correlate strongly with each other. Both took little time and were easy to complete. The ONLS and ODSS showed similar relationships with measures of impairment, ability and participation. They were also valid and remained significantly correlated with measures of impairment and quality of life in a subgroup of patients with forms of neuropathy other than in those on whom the ODSS was originally validated. The only difference was that the ONLS and ODSS did not correlate significantly with those on the SF-36 Role Limitation Physical Subscale in patients with peripheral neuropathies other than GBS and CIDP. This may indicate that patients with GBS and CIDP are limited in a different way, but such a conclusion should be viewed with caution because of the size of the subgroups. The scores obtained from the questionnaire and those obtained when observers rated patients performing the tasks on the ONLS were not in perfect agreement. This is consistent with the report on the functioning of patients with peripheral neuropathy being influenced by other factors in addition to their physical capacity.11 Inter-rater agreement was also slightly lower when the ONLS was derived from observations of a video rather than from directly questioning the patient. This was probably because the observed score is dependent on the rater’s subjective opinion of the quality of performance of the tasks and, as participants were filmed, raters could not adjust their positions to obtain a clearer view of the tasks being performed. Furthermore, the within-patient variation when repeating observed tasks was not measured in this study, and may further reduce reliability. The use of an observed version of the ONLS is also complicated by the need for standardised equipment. Interestingly, low Cronbach’s α scores indicated that the upper and lower limb sections on the ONLS and ODSS measured somewhat different aspects. This was not unexpected, as limitations in the arms and legs would not necessarily change equally or at the same time in people with peripheral neuropathy. This suggests that scores on the upper and lower limb sections should be viewed separately to accurately ascertain patient status. The main difference between the ONLS and ODSS is that the ODSS is unable to detect difficulties with running or climbing stairs. The ONLS therefore shows greater sensitivity to minor disability of the lower limbs. In the ONLS, a score of 0 indicates that a patient has no problems with running, walking or climbing stairs. In the ODSS, a score of 0 only indicates no difficulty in walking. This small difference makes it more difficult to improve from 1 to 0 and so reduces the ceiling effect of the ODSS, but may also reduce the responsiveness of the ONLS. The ONLS is a new scale that measures limitations in the everyday activities of the upper and lower limbs. It correlates well with the ODSS and retains its simplicity. Further work will establish its responsiveness to large changes in clinical conditions and whether it can be used in settings other than outpatient clinics. Its questions are clearer, however, and it has less of a ceiling effect than the ODSS. The ONLS is therefore recommended to record serial changes in limitations in a clinical environment and as an outcome measure in clinical trials. We thank the patients who allowed themselves to be filmed for this study; Dr Claire White and Dr Paul Holmes for assessing the video; and Dr Ingemar Merkies and Dr AV Swan for advice. Merkies IS, Schmitz PI, van der Meché FG, et al. Clinimetric evaluation of a new overall disability scale in immune mediated polyneuropathies. J Neurol Neurosurg Psychiatry 2002;72:596–601. Sharrack B, Hughes RA. The Guy’s Neurological Disability Scale (GNDS): a new disability measure for multiple sclerosis. Mult Scler1999;5:223–33. Merkies IS, Schmitz PI, van der Meché FG, et al. Comparison between impairment and disability scales in immune-mediated polyneuropathies. Muscle Nerve 2003;28:93–100. Hughes RA, Umapathi T, Gray IA, et al. A controlled investigation of the cause of chronic idiopathic axonal polyneuropathy. Brain 2004;127:1723–30. Merkies IS, Schmitz PI, van der Meché FG, et al. Quality of life complements traditional outcome measures in immune-mediated polyneuropathies. Neurology 2002;59:84–91. Hobart JC, Riazi A, Lamping DL, et al. Measuring the impact of MS on walking ability: the 12 item multiple sclerosis walking scale (MSWS-12). Neurology 2003;60:31–6. Merkies IS, Schmitz PI, van der Meché FG, et al. Psychometric evaluation of a new handicap scale in immune-mediated polyneuropathies. Muscle Nerve 2002;25:370–7. van Swieten JC, Koudstaal PJ, Visser MC, et al. Interobserver agreement for the assessment of handicap in stroke patients. Stroke 1988;19:604–7. Medical Research Council. Aids to the examination of the peripheral nervous system. London: Her Majesty’s Stationary Office, 1976. Kleyweg RP, van der Meché FG, Schmitz PI. Interobserver agreement in the assessment of muscle strength and functional abilities in Guillain-Barré syndrome. Muscle Nerve 1991;14:1103–9. World Health Organization. International classification of functioning, disability and health (ICF). Geneva: WHO, 2001. Funding: This study was funded by the Guy’s and St Thomas’ Charity. Ethical approval: The Guy’s Hospital Research Ethics Committee and Guy’s and St Thomas’ Audit Committee approved the study.